Let’s get out our field guides to look carefully at these five Bonus Birds. Generally, it doesn’t matter whether you have an old or new field guide, but it does matter of what geographical area it is. The more specific, the better. It also is a good idea to have more than one field guide and they should be written by different authors. Some people like guides with real photographs and some prefer pictures that are drawn. I think it is very helpful to have one that shows the mapped distribution on the same page as the picture and description of the birds though there are many other arrangements. Check a couple different field guides for pictures of these birds. 1. 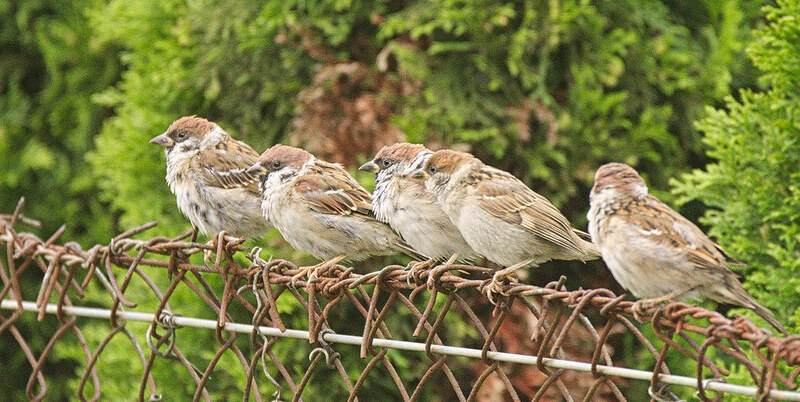 House sparrows – “Common and widespread: the ubiquitous sparrow of cities, towns, parking lots, and farms introduced from Europe in the mid-1800s. Nests in any sheltered cavity, from birdhouses to streetlights to crevices in buildings.” Sibley’s tone indicates that these are probably not the most favored birds at the backyard feeder. They can be aggressive to more favored species and they are known for stealing other birds’ nests. They are fairly easy to identify. The male wears a gray cap, and a black bib. His back is a mixture of dark and rust brown with a white wing bar. His chest is light gray. “City birds are usually dirtier and duller than rural birds.” Females also have the streaked back with bronze edges, brownish white chest and belly, pale eyebrow, and no bib. Both are described as “noisy, highly sociable, feisty.” They are in this area year-round. 3. White-crowned sparrow – Often seen in flocks with the golden-crowned sparrow is this large, distinctive sparrow. Especially in winter, they have very black and white striped crowns, brownish streaked back and wings with two white wing bars. Their face, nape and breast are gray. Immature birds’ stripes are more brown than black. Although they breed on the tundra and alpine forests, they winter in much of North America. Some may live year-round in parts of the West. They feed mostly on the ground or in low brush or can be seen on branches below waist level. If you listen carefully, you can hear the white-crowned sparrows’ lamenting call: Poor me. Poor, poor me. 4. Fox sparrow – This sparrow is kind of tricky because he is dressed differently depending upon where he lives. In the East, he is a foxy red fellow, but in the Pacific Northwest, he is a sooty looking streaked bird. (I like Sibley’s guide here because he shows the different appearance for the different areas.) If you notice dirt and leaves flying in the air under your feeder and it isn’t a rowdy robin, it is probably a sooty fox sparrow. Both the male and female forage in the leaves and debris for their food. That isn’t to say you won’t see them visiting the hanging feeder, but their preference is what they find on the ground. 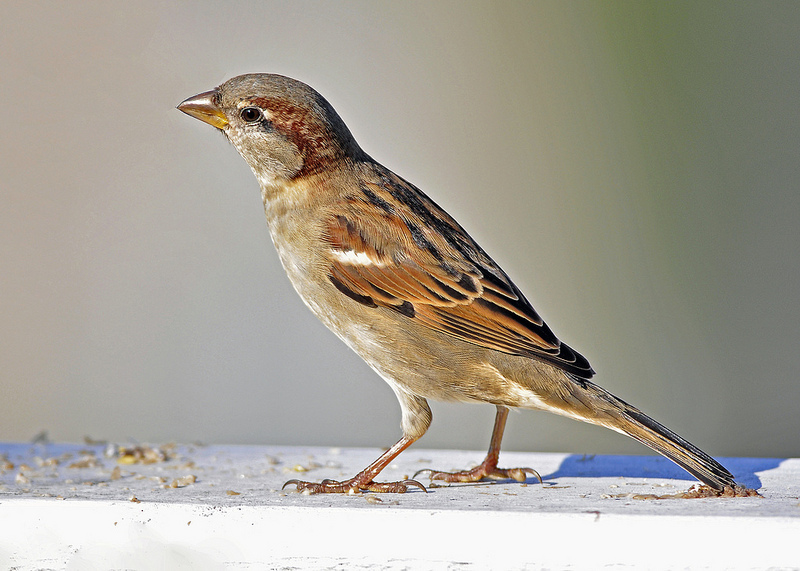 This sparrow with a streaked breast and a center dot, brown back and head, closely resembles the song sparrow with similar breast, back, and song, but streaked head and eye stripe. The song sparrow also has a brown mustache and grey eyebrow. But you won’t find the song sparrow scrounging around in the underbrush like the fox sparrow. 5. Song sparrow – According to my new Birds of the Pacific Northwest by Shewey and Blout , this sparrow is the most common and widespread sparrow in the Northwest, and is among the most melodious. The head feathers are parted in the middle by a thin gray streak with brown streaks on both sides, then light eyebrows and a brown line through the eyes. There is gray again below the eye and a brown moustache. The throat and belly are white with brown streaking and a noticeable brown dot on the white belly. You will probably hear the song sparrow before you see it. What is singing that wonderful song, and in the winter?! Where is it? What is it eating? How is it behaving? Does it have stripes, eye rings, mustache? How big is it? What noticeable characteristics does it have? My first several years watching my feeders, I was happy just to say, it’s a sparrow. I thought I’d never figure them out. Now knowing a little more about what to look for, I can’t imagine not distinguishing the white and golden crown sparrows from the house sparrows. I am still struggling with the female house finch and juvenile white and golden crowns and the fox sparrow and the song sparrow. But I’ll get better as I practice and look in my field guides and go to presentations at the Audubon Center at Railroad Bridge, Wednesday bird walks, and go on line. There are so many opportunities to learn more and the more birds I know, the more I enjoy watching them.